This article is about the Hellenistic region. For the Imperial Roman province, see Syria Coele (Roman province). Coele-Syria, Coele Syria, Coelesyria (Greek: Κοίλη Συρία, Koílē Syría), also rendered as Coelosyria and Celesyria, otherwise Hollow Syria (Latin: Cava Syria, German: Hohl Syrien), was a region of Syria in classical antiquity. It probably derived from the Aramaic for all of the region of Syria but more often was applied to the Beqaa Valley between the Lebanon and Anti-Lebanon mountain ranges. The area now forms part of the modern nations of Lebanon and Syria. It is widely accepted that the term Coele is a transcription of Aramaic kul, meaning "all, the entire", such that the term originally identified all of Syria. The word "Coele", which literally means "hollow" in Koine Greek, is thought to have come about via a folk etymology referring to the "hollow" Beqaa Valley between Mount Lebanon and the Anti-Lebanon mountains. However, the term Coele-Syria was also used in a wider sense to indicate "all Syria" or "all Syria except Phoenicia", by the writers; Pliny, Arrian, Ptolemy and also Diodorus Siculus, who indicated Coele-Syria to at least stretch as far south as Joppa, while Polybius stated that the border between Egypt and Coele-Syria lay between the towns of Rhinocolara and Rhaphia. The first and only official use of the term was during the period of Seleucid rule of the region, between c. 200 BCE and 64 BCE. During this period, the term "Coele Syria and Phoenicia" or "Coele Syria" was also used in a narrower sense to refer to the former Ptolemaic territory which the Seleucids now controlled, being the area south of the river Eleutherus. This usage was adopted by Strabo and the Books of the Maccabees. 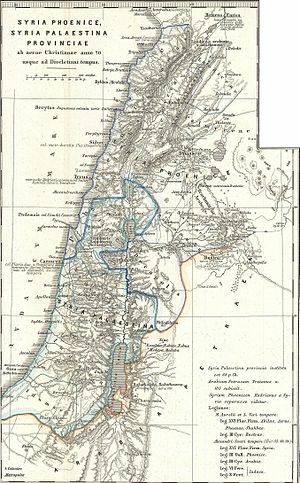 However, Greek writers such as Agatharchides and Polemon of Athens used the term Palestine to refer to the region during this period, which was a term originally given circa 450 BCE by Herodotus. Later during the Roman Period c.350 CE, Eunapius wrote that the capital of Coele-Syria was the Seleucid city of Antioch, north of the Eleutherus. According to Polybius, a former officer of the Ptolemaic Empire named Ptolemy Thrasea, having fought in the 217 BCE Battle of Raphia, defected to the Seleucid king Antiochus III the Great. Antiochus gave him the title "Strategos and Archiereus of Coele-Syria and Phoenicia". Some scholars speculate that this title may have been used previously by the Ptolemies, but no direct evidence exists to support this. The region was disputed between the Seleucid dynasty and the Ptolemaic dynasty during the Syrian Wars. Alexander the Great's general Ptolemy first occupied Coele-Syria in 318 BC. However, when Ptolemy joined the coalition against Antigonus I Monophthalmus in 313 BC, he quickly withdrew from Coele-Syria. In 312 BC Seleucus I Nicator, defeated Demetrius, the son of Antigonus, in the Battle of Gaza which again allowed Ptolemy to occupy Coele-Syria. Though he was again to pull out after only a few months, after Demetrius had won a battle over his general and Antigonus entered Syria in force up to Antigonuses, this brief success had enabled Seleucus to make a dash for Babylonia which Seleucus secured. In 302 BC, Ptolemy joined a new coalition against Antigonus and reoccupied Coele-Syria, but quickly withdrew on hearing a false report that Antigonus had won a victory. He was only to return when Antigonus had been defeated at Ipsus in 301 BC. Coele-Syria was assigned to Seleucus, by the victors of Ipsus, as Ptolemy had added nothing to the victory. Though, given Ptolemy's track record, he was unlikely to organize a serious defense of Coele-Syria, Seleucus acquiesced in Ptolemy's occupation, probably because Seleucus remembered how it had been with Ptolemy's help he had reestablished himself in Babylonia. The later Seleucids were not to be so understanding, resulting in the century of Syrian Wars between the Ptolemies and Seleucids. The Battle of Panium in 200 BC, during the Fifth Syrian War, was the final decisive battle between the two sides in ending Ptolemaic control over the region. The 171–168 BC conflicts over Coele-Syria, between Antiochus IV Epiphanes and Ptolemy VI Philometor, are discussed in Livy’s The History of Rome from its Foundation (in XLII. 29 and XLV. 11–12). Seleucid control over the area of Judea began diminishing with the eruption of the Maccabean Revolt in 165 BC. With Seleucid troops being involved in warfare on the Parthian front, Judea succeeded in securing its independence by 140 BC. Despite attempts of Seleucid rulers to regain territories, the conquests of Pompey in 64 BC were a decisive blow to them, and Syria became part of the Roman Republic. Under the Macedonian kings, Upper Syria (Syria Superior) was divided into four parts (tetrarchies) which were named after their capitals. Later in the Roman Pompeian era, the province was divided into nine districts. Judging from Arrian and The Anabasis of Alexander, the historians of Alexander the Great, as well as more ancient authors, gave the name of Syria to all the country comprehended between the Tigris and the Mediterranean. The part to the east of the Euphrates, afterwards named Mesopotamia was called "Syria between the rivers;" that to the west was called by the general name Coele-Syria, and although Phoenicia and Palestine were sometimes separated from it. Yet, it was often comprehended as the whole country as far as Egypt. Circa 323 BCE Laomedon of Mytilene takes control of Coele-Syria (dissolving Eber-Nari). Circa 323 BCE The Periplus of Pseudo-Scylax lists several cities on the Palestinian coast (Dor, Jaffa, Ascalon, and Acre) that are incorporated into Coele-Syria. In the Wars of the Diadochi, Coele-Syria came under the control of Antigonus I Monophthalmus. Then in 301 BCE, Ptolemy I Soter exploited events surrounding the Battle of Ipsus to take control of the region. The victors at Ipsus finalized the breakup of Alexander's empire. Coele-Syria was allocated to Ptolemy's former ally Seleucus I Nicator, who—having been previously aided by Ptolemy—took no military action to gain control of the region. Their successors, however, became embroiled in a series of conflicts over this issue. Ptolemy, marching on Pelusium, made his first halt at that city, and after picking up stragglers and serving out rations to his men moved on marching through the desert and skirting Mount Casius and the marshes called Barathra. Reaching the spot he was bound for on the fifth day he encamped at a distance of fifty stades from Raphia, (Modern Rafah at the border of Egypt and Israel, north of Rhinocolara (El Arish)) which is the first city of Coele-Syria on the Egyptian side after Rhinocolura. And king Demetrius made Apollonius his general, who was governor of Celesyria: and he gathered together a great army, and came to Jamnia. And when he could not overcome Onias, he went to Apollonius, the son of Tharseas, who at that time was governor of Celesyria, and Phenicia. Having spoken of the three boundaries of Egypt, by which it is distinguished from the rest of the continent, we now proceed to the next. The fourth side is nearly surrounded with a vast sea, without any harbours, being a very long and tedious voyage, and very difficult to find any place of landing. For from Parcetonium in Africa, to Joppa in Cœlo-Syria, for the space almost of five thousand furlongs, there is not one safe harbour to be found, except Pharus. Antiochus was so incensed, ...He at once sent his fleet to Cyprus, and in the first days of spring set his army in motion for Egypt and advanced into Coelo-Syria. When near Rhinocolura he was met by envoys from Ptolemy, who ...begged him to say clearly what he wanted rather than to attack Ptolemy as an enemy—by force of arms—after previously being his friend. Authors of the Roman period differ on the limits of Coele-Syria, some extending and others contracting them. The Geography of Strabo notes that Coele Syria Propria (Proper) is defined by the Libanus and Anti-libanus mountain ranges, running parallel to each other. In the wars between the Ptolemies and the Seleucidæ, the name Cœle (or Hollow Syria) was applied to the whole of the southern portion of Syria, but under the Romans, it was confined to "Cœlesyria Proper" and variously included the district east of Anti-Libanus, about Damascus, and a portion of Palestine east of the Jordan river (possibly of: Trans-Jordan, Perea, or the Decapolis). When then [Moses] he received the supreme authority, with the good will of all his subjects, God himself being the regulator and approver of all his actions, he conducted his people as a colony into Phoenicia, and into the hollow Syria (Coele-syria), and Palestine, which was at that time called the land of the Canaanites, the borders of which country were three days' journey distant from Egypt. Syria holds a broad expanse of the littoral, as well as lands that extend rather broadly into the interior, and it is designated by different names in different places. For example, it is called Coele, Mesopotamia, Judaea, Commagene, and Sophene. It is Palestine at the point where Syria abuts the Arabs, then Phoenicia, and then—where it reaches Cilicia—Antiochia. [...] In Palestine, however, is Gaza, a mighty and well fortified city. The name Syria comes from the ancient Greek regional name for the Levantine colonies and colonial territories which they had established and which were "formerly comprehended as part of Assyria" (see Name of Syria). Syria had an uncertain border to the northeast that Pliny the Elder describes as including from west to east; Commagene, Sophene, and Adiabene. In Pliny's time, Syria was administratively divided into a number of provinces with various degrees of autonomy under the Roman Empire, such as the Ityraei or Ituraei, who were a people of Coelo-Syria famous for shooting with a bow, [The wood of the trees called] "yews are bent into Ituraean bows". Next to these countries on the coast is Syria, once the greatest of lands. It had a multitude of divisions with different names, the part adjacent to Arabia was previously known as Palestine (who's northernmost city was Caesarea, Plin. NH 5.69: "Caesarea ..finis Palastine") or Judaea or Cœle. Antiochus made a friendship and league with Ptolemy, and gave him his daughter Cleopatra in marriage, and yielded up to him Cœle-Syria and Samaria and Judæa and Phœnicia by way of dowry. Circa 125 CE The Roman emperor Hadrian promotes the city of Damascus to "Metropolis of Coele-Syria". Intending to write the history of the Romans, I have deemed it necessary to begin with the boundaries of the nations under their sway.... Here turning our course and passing round, we take in Palestine-Syria, and beyond it a part of Arabia. The Phoenicians hold the country next to Palestine on the sea, and beyond the Phoenician territory are Coele-Syria, and the parts stretching from the sea as far inland as the river Euphrates, namely Palmyra and the sandy country round about, extending even to the Euphrates itself. The Decapolis was so called from its ten cities enumerated by Pliny. And it should be noted, that what Pliny calls Decapolis, Ptolomy makes his Cœle-Syria; and the Cœle-Syria of Pliny, is that part of Syria about Aleppo. The governor of Syria retained the civil administration of the whole large province undiminished, and held for long alone in all Asia a command of the first rank. It was only in the course of the second century that a diminution of his prerogatives occurred, when Hadrian took one of the four legions from the governor of Syria and handed it over to the governor of Palestine. It was Severus who at length withdrew the first place in the Roman military hierarchy from the Syrian governor. After having subdued the province —which had wished at that time to make Niger emperor, as it had formerly done with its governor Vespasian —amidst resistance from the capital Antioch in particular, he ordained its partition into a northern and a southern half, and gave to the governor of the former, which was called Coele-Syria, two legions, to the governor of the latter, the province of Syro-Phoenicia, one [legion]. There is also the colony of Laodicea, in Coele Syria, to which also the divine Severus granted the Italian Law on account of its services in the Civil War. You may delineate the Promised Land of Moses from the Book of Numbers (ch. 34): as bounded on the south by the desert tract called Sina, between the Dead Sea and the city of Kadesh-barnea, [which is located with the Arabah to the east] and continues to the west, as far as the river of Egypt, that discharges into the open sea near the city of Rhinocolara; as bounded on the west by the sea along the coasts of Palestine, Phoenicia, Coele‑Syria, and Cilicia; as bounded on the north by the circle formed by the Taurus Mountains and Zephyrium and extending to Hamath, called Epiphany‑Syria; as bounded on the east by the city of Antioch Hippos and Lake Kinneret, now called Tiberias, and then the Jordan River which discharges into the salt sea, now called the Dead Sea. Libanius (died 392 CE) was born at Antioch, the capital of Coele Syria as it is called. This city was founded by Seleucus surnamed Nicator. ^ "La Syrie creuse n'existe pas", in G. L. Gatier, et al. Géographie historique au proche-orient (1988:15-40), reviving the explanation offered by A. Schalit (1954), is reported by Robin Lane Fox, Travelling Heroes in the Epic Age of Homer (2008, notes p378f): "the crux is solved". ^ a b c A History of the Jews and Judaism in the Second Temple Period, Volume 2, Lester L. Grabbe, p173 "Yet the suggestion is widely accepted that the name actually derives from Aramaic for "all Syria", which was then assimilated by the Greeks to a more usual pattern for place names"
^ From Sartre, pages 21-25: Diodorus 18.6.3, 61.4; 20.73.2; Polybius 8.17.10–11; Pliny, Naturalis Historiæ 5.106–10; Arrian Anabasis 2.13.7; Ptolemy 5.14.1. ^ Studies in Josephus and the varieties of ancient Judaism: Louis H. Feldman. Books.google.co.uk. Retrieved 2011-12-11. ^ Parke, Herbert William. Sibyls and sibylline prophecy in classical antiquity. Books.google.co.uk. Retrieved 2012-05-28. ^ Marcus Junianus Justinus; Yardley, J. C.; Wheatley, Pat (15 December 2011). Justin: Epitome of the Philippic History of Pompeius Trogus: Volume II: Books 13-15: The Successors to Alexander the Great. Clarendon Press. p. 91. ISBN 978-0-19-927759-9. 4. 12. Syria, was given to Laomedon of Mytilene. Curt. 10. 10. 2; Diod. 18. 3. 1; Arr. Succ. 1. 5; Dexippus, FGrH 100 F 8 §2. Syria here is Coele-Syria (Hollow Syria), in effect, the old Persian satrapy of Abarnahara ('the land beyond the river'; cf. Lehmann-Haupt §26; cf. §§129 ff). By strict definition, 'Hollow Syria' was the area between Lebanon and Antilebanon, though it came to represent the stretch from the Orontes to the Dead Sea. Strabo 16. 2. 16 C755 shows that it includes Damascus and the Jordan River, and that its northern and southern reaches are roughly parallel with Tripolis and Sidon respectively. Since the satrapy lists do not include a separate ruler for Phoenicia, we must conclude that Coele-Syria in the broad sense includes Phoenica as well; see also Pliny, HN 5. 13. 66-7. ^ Ameling, Walter; Cotton, Hannah M.; Eck, Werner (14 July 2014). South Coast: 2161-2648: A multi-lingual corpus of the inscriptions from Alexander to Muhammad. De Gruyter. p. 239, note 14. ISBN 978-3-11-033767-9. The text is in bad shape and has been restored as follows: "Doros (Dor), a city of Sidonioi, <Ioppe (Jaffa), a city;> they say it was here that Androm<eda> was <ex>posed <to the monster. Aska>lon, a city of Tyrioi and a royal seat. Her<e is the boundary of Koile> (Hollow) Syria." (Shipley 2011, Pseudo-Skylax's Periplous, 104,3) Apparently the source lists the major cities on the Palestinian coast, apart from Gaza. ^ Shipley, Graham (2011). Pseudo-Skylax's Periplous: The Circumnavigation of the Inhabited World : Text, Translation and Commentary. Bristol Phoenix Press. ISBN 978-1-904675-82-2. ^ Kelly, Douglas; Londey, Peter (30 June 2016). Conflict in Ancient Greece and Rome: The Definitive Political, Social, and Military Encyclopedia [3 volumes]: The Definitive Political, Social, and Military Encyclopedia. ABC-CLIO. p. 981. ISBN 978-1-61069-020-1. In 301 BCE, Judaea was incorporated into the Ptolemaic province of Coele-Syria. Then in 200 BCE, the Seleucids conquered Coele-Syria. ^ Shuckburgh, Evelyn. "Polybius, Histories". Follow PerseusDigLib on Twitter Perseus Digital Library. Tufts University. Retrieved 28 January 2015. I shall tell how Antiochus (Antiochus III the Great) and Ptolemy Philopator (Ptolemy IV Philopator) first quarreled and finally went to war with each other for the possession of Coele-Syria. (Syrian Wars 219–217 BCE) [...] (Now I come to) the disturbances in Egypt; (The attempted partition of the dominions of Ptolemy V Epiphanes c.204) how, after the death of King Ptolemy (IV), Antiochus and Philip (Philip V of Macedon) entered into a compact for the partition of the dominions of that monarch's infant son, I shall describe their treacherous dealings. Philip laying hands upon; the islands of the Aegean and Caria and Samos. Antiochus upon; Coele-Syria and Phoenicia. 3:8. So Heliodorus forthwith began his journey, under a colour of visiting the cities of Celesyria and Phenicia, but indeed to fulfil the king's purpose. 8:8. Then Philip seeing that the man gained ground by little and little, and that things for the most part succeeded prosperously with him, wrote to Ptolemee, the governor of Celesyria and Phenicia, to send aid to the king's affairs. ^ "Titus Livius (Livy), The History of Rome, Book 45, chapter 11". www.perseus.tufts.edu. ^ "LIVY - History of Rome". mcadams.posc.mu.edu. Liv. 33.19: During the previous summer Antiochus had reduced all the cities in Coelo-Syria which had been under Ptolemy's sway. Liv. Liv. 42.29: Antiochus was threatening Egypt, and in his contempt for the boy-king and his unenterprising guardians he thought that, by raising the question of Coelo-Syria, he would have a good pretext for war. ^ MacBean, Alexander; Johnson, Samuel (1773). "Coelesyria". A Dictionary of Ancient Geography: Explaining the Local Appellations in Sacred, Grecian, and Roman History; Exhibiting the Extent of Kingdoms, and Situations of Cities, &c. And Illustrating the Allusions and Epithets in the Greek and Roman Poets. The Whole Established by Proper Authorities, and Designed for the Use of Schools. G. Robinson. pp. 191–192. Coelesyria, some write it conjoined as here, others, as the Greeks, Coele Syria, separate, which seems the juster way, because Pliny not only separates these words, but also simply says, Coele, an ancient inscription. Authors differ much in settling its limits, some extending, and others contracting, them too much: Strabo says, Coele Syria Propria is defined by Libanus and Anti-libanus, running parallel to each other. Now if we determine the limits of these two mountains, we shall go near to settle those of Coele Syria. They both begin a little above the sea; Libanus near Tripolis; chiefly against the spot called Dei Facies: Antilibanus at Sidon; but they terminate near the mountains of Arabia, above the territory of Damascus, and near the mountains of the Trachonitis, and there they terminate in other mountains, Strabo. ^ Richardson, Peter (1 January 1999). Herod: King of the Jews and Friend of the Romans. Fortress Press. p. 70, note 74. ISBN 978-1-4514-1594-0. On Coele-Syria as a geographic designation, see Millar, Roman Near East, pp. 121-23, and .42 with bibliography cited there, including E. Bickerman, "La Coelé-Syria: Notes de géographie historique," RB 54 (1947): 256. The term floated; it did not have the connotations in antiquity that it now has. Most helpful is Strabo, Geog. 16.2.16-22: in 16-20 he discusses Coele-Syria proper, the area between the Lebanon and Anti-Lebanon Mountains; then in 21 he says the whole area between Seleucia (i.e., Syria) and Egypt-Arabia is called Coele-Syria, pointing out that "the country marked off by the Libanus and the Antilibanus is called by that name in a special sense" (see also 22). He is not confused but reports differing contemporary usages. ^ Pomponius Mela (1998). Frank E. Romer, ed. Pomponius Mela's Description of the World. University of Michigan Press. p. 52. ISBN 0-472-08452-6. 62. Syria holds a broad expanse of the littoral, as well as lands that extend rather broadly into the interior, and it is designated by different names in different places. For example, it is called Coele, Mesopotamia, Judaea, Commagene, and Sophene. 63. It is Palestine at the point where Syria abuts the Arabs, then Phoenicia, and then—where it reaches Cilicia—Antiochia. [...] 64. In Palestine, however, is Gaza, a mighty and well fortified city. ^ Crane, Gregory. "Pliny the Elder, The Natural History John Bostock, M.D., F.R.S., H.T. Riley, Esq., B.A., Ed". Perseus Digital Library. Retrieved 25 January 2015. Plin. Nat. 5.13, CHAP. 13. (12.)—SYRIA. ^ Butcher, Kevin (2004). Coinage in Roman Syria: Northern Syria, 64 BC-AD 253. Royal Numismatic Society. p. 220. ISBN 978-0-901405-58-6. ^ Barclay Vincent Head (1887). "VII. Coele-Syria". Historia Numorum: A Manual of Greek Numismatics. p. 662. ^ Appian of Alexandria. "Preface of the Roman History". Livius.org. Retrieved 2011-12-11. ^ Crane, Gregory. "Dictionary of Greek and Roman Geography (1854) William Smith, LLD, Ed". Perseus Digital Library. Tufts University. Retrieved 27 January 2015. ^ Lendering, Jona. "Provinces (Roman)". Livius. Livius.org. Retrieved 26 January 2015. ^ "Ulpian on Tyre's Juridical Status". www.livius.org. Retrieved 27 June 2016. Bagnall, R.; J. Drinkwater; A. Esmonde-Cleary; W. Harris, R. Knapp; S. Mitchell; S. Parker; C. Wells; J. Wilkes; R. Talbert; M. E. Downs; M. Joann McDaniel; B. Z. Lund; T. Elliott; S. Gillies. "Places: 991407 (Syria Coele)". Pleiades. Retrieved March 8, 2012. Barclay Vincent Head (1887). "VII. Coele-Syria". Historia Numorum: A Manual of Greek Numismatics. p. 662.